A rebel with a cause, Klute is truly unique artist and continues to be creative force in Drum ‘n’ Bass after well over a decade in the scene. His productions mix strong melodies with tough beats, bearing the influence of Klute’s roots in punk and techno, and his livewire DJ sets known for their energy and intensity. His label, Commercial Suicide, has gone from strength-to-strength with recent releases from heavy hitters such as Amit, Break, Hydro and SKC with more in store for 2010 from the likes of Dom & Roland, Mindscape and Nymfo. Klute’s sixth artist album ’Music for prophet,’ is set for release in May. Silver was nominated best DNB DJ & Best International act at The 2009 Drum & Bass Awards. Next to having released on the biggest Drum ‘n’ Bass labels around, Silver runs 2 record labels - one being the highly blessed Science Fiction Records which he co-runs with his partner Sonic. The other being Nemesis Recordings. Silver has worked with many famous artists such as Skream, Digital, A Sides, Jenna g , J Majik, Lutin, Gridlow, … and has now released his last album this entitled "Dance Dance Dance” on Nemesis Recordings. 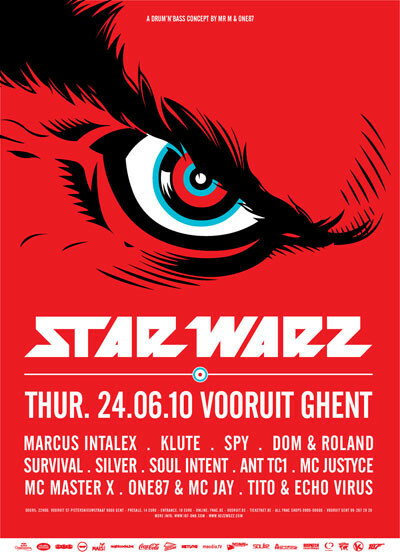 Both as an artist and a DJ, Marcus Intalex represents the forefront of soulful musical drum & bass. Heading up the legendary Soul:r label along with long-term collaborator ST Files (as MIST), he’s worked with artists such as Calibre and Martyn and always sought to release quality music with lasting appeal. Marcus’s DJ sets have earned him a reputation as a tastemaker, not afraid to test crowds with a fresh high quality selection from across the spectrum of drum & bass. He represents Soul:ution with residencies in Manchester and at London’s Fabric plus a radio show for Red Bull Music Academy. Look out for more from Marcus and Soul:r in 2010, including collaborations with S.P.Y and the release of an album by Soul:ution’s own MC DRS. A talented new artist and highly-skilled producer, S.P.Y has already proved himself in the studio working alongside the likes of DJ Marky, Marcus Intalex and Total Science. Crisp, clean breaks rolling over deep basslines are his stock-in-trade and a busy DJ schedule has seen appearances across world everywhere from Australia to his native Brazil. Without doubt one of the most original and creative forces behind Drum ‘n’ Bass, Dom & Roland really needs no introduction. Whether as a producer in his own right or as an engineer for somebody else, Dominic Angas has always sought to push himself to create music that stands apart with a unique quality of its own. As a DJ, Dom shares the same philosophy with his production and his sets contain some of the toughest, freshest dancefloor drum & bass around. His fifth LP ‘No Strings Attached’ brings together collaborations with Noisia, Amon Tobin, Hive, Audio and Rob Playford and sees Dom embarking on a worldwide album tour in late 2009/early 2010. Following productions as one half of Banaczech in the mid-90s, Survival burst back onto the scene with a host of finely-tuned Drum ‘n’ Bass workouts for the likes of Creative Source, Critical, DNAudio, Shogun and Quarantine. His self-titled debut album for dBridge’s esteemed Exit Records cemented his reputation as a top producer and his own imprint Audio Tactics is quickly becoming a byword for quality. Surival will share the decks with Ant TC1 who receives massive support from the whole scene. He runs Dispatch Recordings and will release a second volume of his mix-cd series "Mixed & Dispatched" this year. The party will be started by no one less Soul Intent who can be found on numerous labels as Vampire and 31 Records. Wicked productions as well as wicked dj sets ! Resident One87 doesn’t really need an introduction as we hope you all know he’s now also gotten into production with releases on Critical and Nemesis Recordings. He will be joined by Mc Jay from Holland. Second appearance of Tito & Echo Virus from the Stealth Bombers collective on Star Warz and knowing them and their parties, we have all faith in them. Justyce has been in the game since 1992, since 1996 as Metalheadz resident MC. He is one of the few MC’s out there that work with the DJs instead of against them. Justyce knows when to raise the level and when to let go and let the music speak for itself. A quality that made him Doc Scott’s preferred touring partner and made it possible for him to perform alongside all the other stars, from Roni Size to Goldie. MC Master X is one of the freshest new vocal talents to emerge from the UK Drum ‘n’ Bass scene. With an array of nu skool flows and a distinctive lyrical style, he has become recognized as being one of the most exciting up and coming artists on the Drum ‘n’ Bass circuit. His unique voice compliments any DJ’s set and is one of the few MCs out there who can adapt his style to suite all genres of Drum ‘n’ Bass.